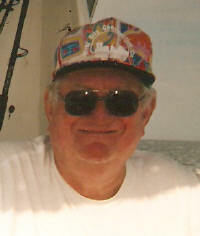 Douglas H. Glanzner, 69, of New Memphis, and formerly of Trenton died, Monday February 2, 2009 at his residence. He was born October 11, 1939 in Highland, IL to Harlan and Aurelia (Brefeld) Glanzner; they preceded him in death. Also preceded in death by father-in-law, Mack Bean. He married Molly Bean-Spihlmann on October 10, 2008 in Carlyle, IL; she survives in New Memphis. Step-Daughters, Lou (friend Casey Sabaleski) Trame of New Memphis and Ronda (friend J.R. Pflasterer) Spihlmann of Mascoutah. Mother-in-law, Gracy Bean of Beckemeyer. Doug was the former owner/operator of Glanzner Funeral Home and Glanzner Furniture and Carpet World in Trenton. He was a member of the New Memphis Community Club, a former member of the Trenton Nut House Club and the Trenton Sportsmen’s Club, he was an avid fisherman. Friends may call at the New Memphis Community Club on Saturday, February 7, 2009 from 2:00-4:00 PM. In keeping with his wishes, Doug was cremated.